Just ask the parents out there how kids react after consuming large quantities of sugar-sweetened foods and beverages. This is why many schools have initiated healthy lunch and breakfast programs to ensure kids have the energy and focus for learning. Hardly ever do we turn on the news or open the paper without coming across another story high-sugar foods to obesity. In particular, children, teens, and adults with high-glycemic diets (the foods and drinks that cause blood sugar to spike and crash quickly) are most often carrying around excess weight. Sure, stay out of the sun, but you should also stop eating refined sugar if you want to continue to lie about your age. 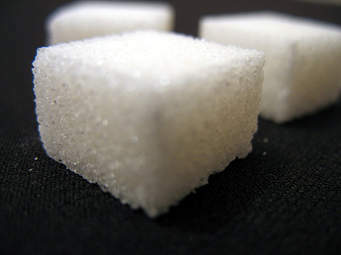 Refined sugar causes wrinkles by reducing the elasticity in your skin. So the more sugar you consume in your diet; the fast you will start noticing those fine lines, wrinkles, and sagging skin. You might think you binge on sugar because you’re stressed out. However, oftentimes, your actual stress levels are affected by the amount of sugar in your diet. For example, when you eat a chocolate bar, your blood sugar spikes quickly and then plummets, causes the body to discharge a series of stress hormones (i.e., adrenaline, epinephrine and cortisol), which trigger your fight or flight response (aka: nerves). Any imbalance in the body over a long enough duration will cause sickness. And studies link diets high in refined sugar to bodies that produce excess bacteria and yeast, which feed on sugar and result in various infections, illnesses, and diseases. If you’re proud of that pearly white smile what are you doing eating all that sugar? Refined sugar breaks down the enamel of your teeth, causing tooth and gum decay faster than any other food substance. So give the soda a rest of you expect those pearly whites to stay bright. Periodonatal disease (gum disease) does more than ruin your smile. In fact, the bacteria in your mouth caused by periodontal disease can ruin your heart faster than it will damage your teeth by spreading to your bloodstream and raising the risk of coronary artery disease. High blood glucose is highly toxic for your body. Unfortunately most western diets are high in the type of refined sugar that causes blood sugar so high that the insulin in your body stops working (a condition called insulin resistance), leading to a variety of diseases—namely type II diabetes and metabolic syndrome.